Editor's note: Christian Sager is the creator of "Think of the Children" and "Border Crossings." He has also written essays about the comics industry, punk subculture and national identity. I don’t buy products from my local comic shop anymore. The retail prices were already too high for my budget, but in-store markups turned me off even more. I realized if I mail-ordered my comics ahead of time they came with a significant discount. I just filled out my November order and I’m saving an average 32% on what those comics would cost me off the rack. More comics for fewer monies. The downside to mail ordering is that I have to wait to read them - between two and four weeks after the books are released in stores. Unless I want the stories spoiled, I can’t participate in conversations about the newest issues. And if I don’t order something that unexpectedly gets rave reviews, I’m stuck waiting several months for it to be collected. It’s that or visit my local shop again, where the critically acclaimed books are either sold out or marked up. With the advent of digital comics, I’m starting to get the best of both worlds. Many comics are available on the cheap and if I absolutely feel the need to read something the day it came out, it takes less than a minute to download it legally. Digital comics seem to be growing two audiences: one that is looking specifically for less-expensive comics than what's available in stores, and one that aren't as concerned with price as they are immediate acquisition. Digital comics have a variety of prices, from as low as 99 cents per issue to as much as $3.99 for an issue released digitally the same day that it’s distributed in print (a.k.a. “day-and-date”). “Clearly both high-quality storytelling and same-day-as-print releases have value,” said David Steinberger, CEO of ComiXology, the current top digital comics vendor. If you’ve never bought digital comics before, you’re probably wondering where to get them and what makes the vendors different from one another. To learn more about how other readers consume digital comics and what’s involved in their production and distribution I turned to three different digital comic vendors (Graphicly, ComiXology and iVerse) and one manga publisher who is distributing their digital content alone (VIZ Media). I first went to Graphicly, a company I’m already familiar with because they distribute my own comic in digital format. I work with them because while Graphicly sells digital comics from major publishers, they focus on supporting independent creators. “Ultimately, the Graphicly platform is unique from our competitors in our dedication to supporting creators and publishers large and small,” said vice president of external relations Ron Richards. Graphicly highlights the communal aspect of being a comic book fan by making it easy to share digital comics via social media. Graphicly also adds extras to further enhance their content, like bonus content and audio commentaries. Recently, they acquired the “Double Feature” app, which provides the ability to incorporate work-in-progress layers onto each page, as well as scripts and commentaries. You can see what the original rough pencils look like or compare a writer’s script to how the artist rendered it on page. Graphicly’s most unique functionality, however, is the ability to embed a digital comic into a web page and share it via social media. From within these embedded modules anyone can preview a comic and purchase it directly. This kind of community sharing is what all of the digital comics vendors I spoke to hope will help new readers discover comics. “Comics” by ComiXology is the only app that has both Marvel and DC titles on their platform. They have sales nearly every day of the week. For instance, when the second season of “The Walking Dead” debuted a few weeks ago, ComiXology reduced the cost of almost every "Walking Dead" issue to 99 cents. Steinberger believes that increasing distribution is crucial to getting more people to read comics. 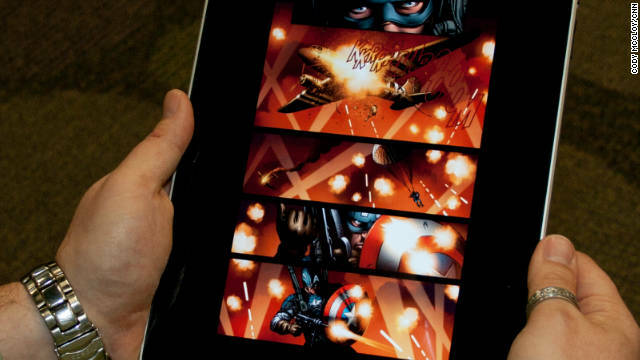 The more readers digital comics have, the better the chances are that their prices will lower. This strategy would make the digital readers seeking lower prices very happy. Steiberger’s plan might be working. The “Comics” app by ComiXology has been the #1 grossing iPad app for seven Wednesdays in a row. It seems lots of people are reading digital comics. iVerse CEO Michael Murphey says his company is very focused on finding new readers, and pursuing initiatives that will appeal to the next generation of readers. He cites their upcoming “Red Circle Heroes” initiative with Archie Comics as an example of this. The initiative is subscription based, costing about the same as a single monthly comic with a new story every week and access to hundreds of back issues. They also host 99 cent sales and have “Flash Mob Fridays” where a title will go on sale for a few hours at a discounted price. Like Graphicly, iVerse’s “Comics Plus” app also allows for bonus content, such as video support that allows creators to add content they couldn’t include on paper, such as interviews or additional parts of the story. Viz Media is different from these other three companies in that they’re actually a publisher that’s developed their own digital storefront, rather than utilize a third-party vendor. They’ve taken on the distribution role themselves and the investment cost that comes with it. One major reason for this was that when they launched they felt the existing platforms weren’t optimized toward the manga reading experience, both in terms of manga page displays and the way the product would be merchandised. “Manga has a particularly different ‘grammar,’ if you will, from American comics that doesn’t make the viewing solutions for American digital comics directly transferable to manga,” said Alvin Lu, senior vice president and general manager for VIZ Media. Controlling their own digital distribution also allows Viz to unify digital sales with marketing and merchandising. They experiment with various promotional sales, like their current 99 cent sale on “Neon Genesis Evangelion” chapters. Lu thinks that digital manga has trailed behind American comics publishers but is going to have a big impact soon. Like those publishers, VIZ is measuring the response to different pricing and discounting strategies. All three of the vendors I spoke with allow their publishing partners to choose the price point for their products, though they occasionally provide advice based on sales trends. None of them charge a fee for their service, but they do take a percentage of each sale. So do the app stores, whether it’s through Apple, Google etc. So does this cost/benefit analysis, plus ComiXology’s success mean that digital comics are overtaking print? None of these vendors seem to think so. All agree that print and digital distribution are working together to increase comic book sales overall. “Combining both makes more money for the publisher and the creators. The wider the net, the better it is for everyone,” said Murphey. As a consumer, I’m with Murphey. Just because digital vendors provide me with cheap comics and day-and-date delivery, doesn’t mean I’m going to stop ordering print comics. But I will take advantage of digital sales and availability, as well as all the cool features these apps provide to enhance my reading experience. If digital comics continue to nurture the comics market without cutting into print sales than both are here to stay. I’m excited at the prospect that this new model could develop into a bigger comics community with more readers and even more stories. "warehousing of inventory, shipping to stores/customers etc." .... There are costs still involved in these areas for the distributors. Maintaining databases/servers are the 'warehouses', and paying for bandwidth off the servers are the 'shipping' costs. But , compared to their real-world print counterparts, these are minuscule. The best is still free: Sluggy Freelance. There's a third audience that will grow thanks to digital comics – potential customers who have never felt welcome in a traditional comics store. Specifically, women – 50% of the population – who are often discouraged by the boys-club atmosphere. And don't forget children (the next generation of comics buyers) who also don't have easy access to a traditional comics store. The meteoric sales figures of manga in the past decade are largely because they've tapped into these two huge markets, women and children, who are left out of the universe of DC and Marvel's largely male-orientated mature-rated superhero franchises. I downloaded the VIZ Media app last week, it looks beautiful on my ipad and I purchased several shojo manga, with plans to buy more soon. But drive to a comics store to buy Batman? No, thank you. I purchase weekly at my local comics shop, and have never felt like an outsider or discouraged for being a woman- on the contrary. The two fellas who run the place always offer suggestions, ask me what I've been enjoying (or not), and we'll have discussions on the books where our tastes overlap. In the future, once I do decide to purchase a tablet computer or Kindle Fire, or the like, I may purchase digital comics in a pinch (miss Buffy or Angel? No way!!! )- but I still prefer the camaraderie of rubbing elbows with my fellow comic book geeks and the once weekly trip to the bricks-and-mortar. I had the good fortune to visit The Beguiling in Toronto which is truly a fabulous store for graphic novels – the staff were incredibly friendly and helpful. Unfortunately I don't live in Toronto and the comics store in my home town is, frankly, creepy. I don't feel comfortable going there, let alone taking my daughters shopping with me. Now that the Borders bookstores have closed, it is essential that companies find easy and attractive ways for paying customers to access their products. So far the digital comics seem to be a promising solution. The Comixology app is attractive although most of the free previews are quite small. I just added the free Kodansha Comics app to my ipad and it is quite similar to the VIZ Media app although they really need more free previews and the response time is too slow – it takes a minute to get each page in focus whereas the VIZ pages are seamless. Still, this is definitely the wave of the future. And you tohguht that I'm busy? Whew! Love all your event photos and the night shots... stunning!